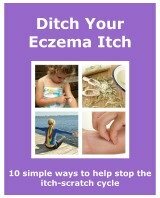 Skin blisters are a symptom of severely inflamed eczema. Wetness can be a by product of them, and tends to be an indication of an infection. Blisters are also called vesicles. In atopic eczema they tend to be quite small in size. They are caused when the skin is damaged and inflamed. When inflammation occurs the blood vessels swell. This results in the leakage of fluid. This fluid collects between the skin cells. If there is adequate fluid it merges to form blisters. The blisters are normally bigger, and seen on the hands and feet. 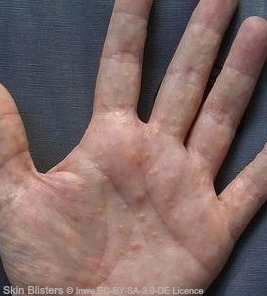 Smaller blisters may be seen in active eczema. Quite often found along the sides of your fingers. When they are scratched, they burst. They are filled with clear liquid, like a water balloon. When the fluid dries it forms a yellow coloured crust, looking like a scab. It is recommended to leave the crusts alone. No scratching or picking them. Doing so could mean they take longer to heal, and may scar. As well as coming from blisters the fluid can also come from the deeper tissues of the skin. They occur when the skin becomes damaged. You may notice that the fluid is sometimes mixed with blood. The blood comes from small blood vessels that have been damaged from scratching. I don't often get blisters. If I do it is normally where I have scratched a lot over a short period of time. Its not the same for everyone. Some people never have blisters, while some have them very frequently. When my skin is wet and I can see clear fluid on the skin, it normally means that my eczema is infected. This means a trip to my doctor to get a prescription for antibiotics.